What goes up, must eventually come down. For too long the wind industry has owned the game. Now, increasingly furious communities are fighting back and they are winning. Driven nuts by noise and shadow flicker, neighbours are no longer prepared to act as doormats or roadkill for a subsidy-soaked industry run by liars, frauds and sociopaths. 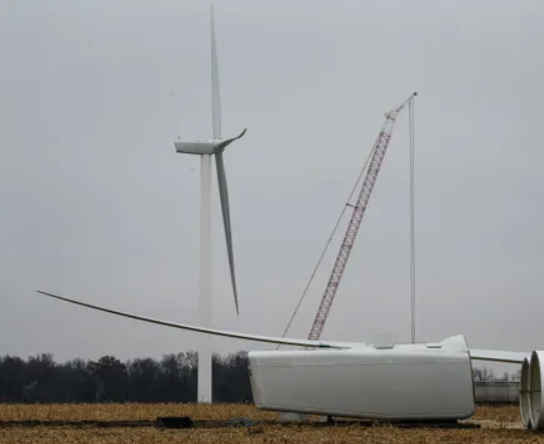 A group of farmers from Iowa have tackled the wind power outfit responsible for their daily torment. And they have won: with a judge finding that the three turbines in question were erected without the proper permits and, accordingly, ordering their immediate destruction (pictured above is one of the three offending units being demolished outside of Fairbank on Friday, 16 November 2018). Needless to say, the victors are ecstatic.